Serving Food Just Like Good Ol' Mom Used To Throw Out! After witnessing first-hand how our Dinosaurs can chomp down 300 pounds of raw, stinky, blood-spewing guts from the bowels of some hapless, squealing, yelping, creature with each and every bite... we're pretty darn sure your own little tum-tum will growl with the anticipation of the sometimes tasty, if not outright nauseous treats that await you at C4CS's Kretaceous Kitchen! Plan to stop by! Try some of our cuisine - most of it now health inspected! Our renowned cooks, renowned by the local Health Department, will burn breakfast, dinner, or lunch anytime day or night, as long as they are here and still alive. Chef Boyd R. Dee and Chef Russell Opsumgrubb both agree the main reason for their long-term career here is due mostly from the fact that they refuse to leave the kitchen area. Allow our Head Maitre de, Luke Wahrm, to guide you in your choice of elegant dinner suggestions. Just think, eggs anyway you want them, as long as you want them runny or rubbery. Fire-grill that DinoSteak [uhhhh... 80% horsemeat, and 25% unknown] to your choice, of raw, very very rare, or burned beyond recognition. Several of our meal options are now listed as "Heart Attack On A Plate" for ease in your selection. 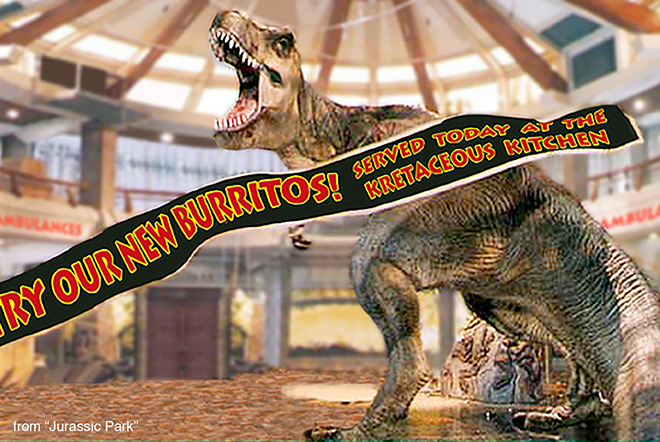 What makes the Kretaceous Kitchen! even greater than the lousy food are the often-visiting 30-to-50-foot Dinosaurs from the IPs right across the hall. 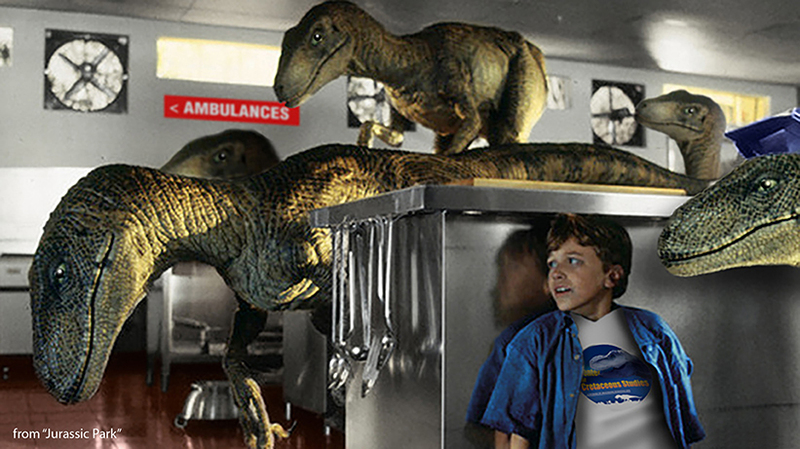 Whereas the rest of The Center goes into Emergency DinoAlert!, we've found that as long as you feed them a scrap or two off your plate, the giant meat-eaters will usually leave you alone. Not that they don't get confused once in a while between "a scrap" and "a leg". THEN it can get rather unpleasant for a moment or two for our remaining dining patrons. Other than a misplaced tail or rear end knocking you unconscious at your table or flinging you airborne across the room, you'll witness just how false the saying "like a Dinosaur in a China shop" is. The word "graceful" comes to mind. Not that it's the correct word, but it just comes to mind. Nah, when these things walk across the room, your wine glass is going to bounce like it's in a paint mixer, your main entre and the plate bearing it will probably slide right off the table into your lap, and that's only if the table remains upright. HEY, HOW ABOUT SOME GOOD REASONS TO EAT HERE?!? Ok, there are none. 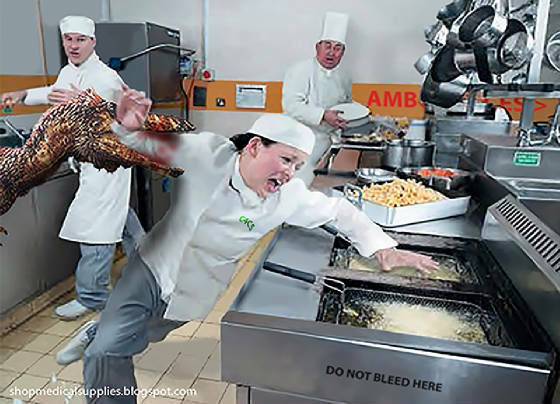 But if you see some "thing" being eaten by one of the C4CS Dinosaurs during your visit, our Chefs will be more than happy to "grill one up for ya"! We no longer charge to see the menu, plus there are unlimited napkins before 4:30 (a.m.)! If you order more than $20 worth of food and drinks, not only will we actually bring it to your table, for a small convenience fee, but you'll also get a coupon for free stomach pumping at only half price! Bring that special someone here for a dimly-lit, romantic, evening dining experience. We keep it dimly lit because sometimes it helps not to see your food. We pipe in only the best (cheapest) soothing music to mask out the roaring, the bellowing, the screaming, the alarms, and the.... well, you get the idea. THE T AGREES - THERE'S NOTHING LIKE GOOD FOOD! 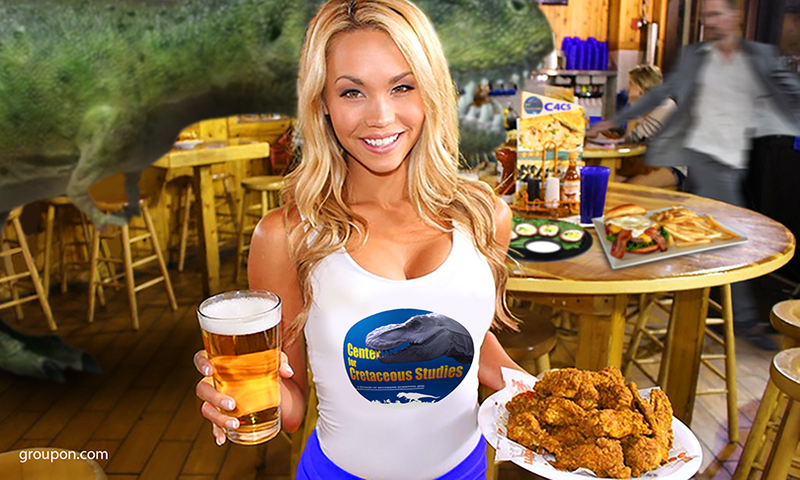 Have your next party at the Kretaceous Kitchen and we'll give you free salt and pepper shakers at your table(s), plus a free commemorative 'spork' which you can take home [for a small fee]! The Kretaceous Kitchen and dining area are great for birthdays, anniversaries, wakes and funerals [our most common party themes], and other meaningless celebrations to go along with your agonizing day here at The Center for Cretaceous Studies. As a final note, when the electricity goes out, we'll give away free ice cream to all seated and breathing customers at the Kretaceous Kitchen. And believe it, we go through TONS of ice cream every week. Visit Cretaceousland! and get even closer to these man-eating, blood-thirsty, killing machines. You can even touch them and pet them! And who knows? You may even live to remember it! For more information on Cretaceousland!, and to start planning that final, exciting, vacation for you and your family, click onto the link below! Although We Don't Offer "Doggie Bags" You Can Ask Your Waiter For A "Sick" Sack, Which Can And Will Be Used! CLICK HERE TO VISIT CRETACEOUSLAND NOW!